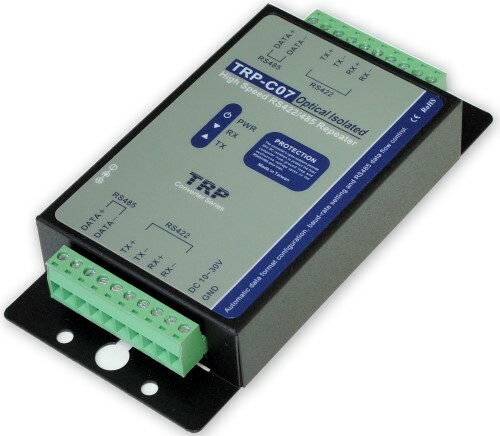 TRP-C07 is designed to extend the RS-422 and RS-485 signals to another 4000ft ( 1200m ) distance and increase the maximum number of connected nodes up to 32 sets. Aside from extension function TRP-C07 provides with auto configuration features in data format detecting, baud rate setting and RS-485 data direction flow control. TRP-C07 is equipped with photo-couplers and internal surge protection to protect the module and all data lines against high voltage spikes, as well as ground potential differences. The industry standard DIN rail and panel mounting design enable user a fast and professional installation. TRP-C07 is the ideal solution for the user who wants to automate their application quickly, safely and cost-effectively. 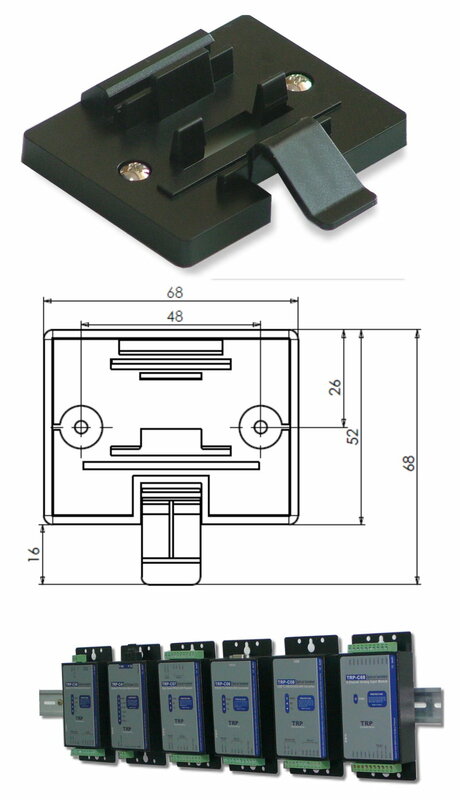 Support screw terminal and external DC adapter. Power input type: Support screw terminal or external DC adaptor. Interface: Industrial plug-in screw terminal. RS-485 signal: differential 2 half-duplex wires. (D+,D-). RS-422 signal: differential 4 full-duplex wires. (TX+,RX+, TX- ,RX-). Plug-in screw terminal wiring: Accepts AWG -#12~30 wire. Distance: extend RS-422/485 signal up to 4000ft (1200M ). LED indicator: Power, TX, and RX.